Idean worked with the Airbus’ A³ group to design the online booking experience for Transpose, a revolutionary new travel service that allows passengers to personalize their flight experiences in a fun and intuitive way that’s never been done before. A³’s Transpose concept is a modular system of commercial aircraft cabins that unlocks the potential for airlines to customize every flight with innovative new passenger experiences like spas, meeting rooms, restaurants, family pods, and more. An important part of the Transpose experience takes place before the passengers even reach the airport: the excitement of putting together their customized Transpose flights. This is where Idean’s expertise in digital design brings to life the customer experience of Transpose in a uniquely inspirational way. We are painfully aware of how tiresome it is to book plane tickets. Now imagine asking passengers not only to book their flights but also to figure out what they want out of a flight experience. Our challenge was to keep the passenger’s online booking experience simple, stress-free, and engaging. A patented design of an online service to discover, book, and personalize travel on a Transpose flight. A typical booking experience includes choosing a destination, a travel date, and a class of travel. On a Transpose flight, there will be more experiences on offer, as the flight itself becomes a memorable experience. Considering the additional decisions travelers have to make during the Transpose booking experience, it was crucial to make informed design decisions through comprehensive user research and frequent workshops across the combined team. As the starting point to the design process, Idean asked guiding questions such as ‘What are the expectations and underlying rules travelers have during booking?’. Based on user research, potential travelers were categorized into two key categories: Planners and Non-Planners. While Planners like to feel in control and have a reliable schedule ahead of time, Non-Planners prefer flexibility and tend to make spontaneous, mood-based decisions. The needs of both types of users were considered throughout the design process, which played a pivotal role in how the overall booking experience was devised. Idean carefully divided the booking process into stages, which gives passengers clear choices and goals to guide them along the process of discovering, choosing, and customizing a unique journey made possible by Transpose. The first stage of the booking process is to choose among a set of carefully curated itineraries called “Collections.” Each Collection offers a complete flight itinerary of varied “Experiences” available on-board, and each Experience is made possible by a module aboard the flight. For example, a business traveler might seek out a Corner Office Collection which includes time in a coworking space for a working lunch, while a couple on vacation might enjoy a Resort Collection with primetime spa access. Airlines could offer not only exclusive activities, but also distinct Collections based on their deep understanding of their customers’ preferences along specific routes and times. 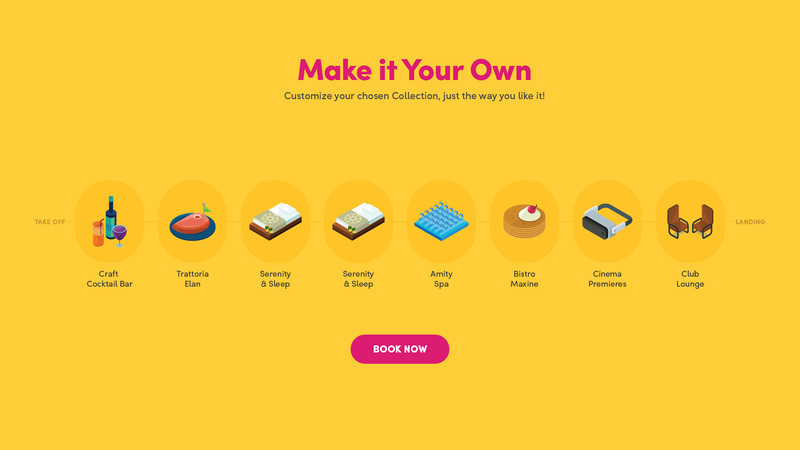 A Collection is designed to be a complete package, but the possibilities of Transpose shine at the next stage of the booking process—personalization. Here, passengers see their Collection laid out as a timeline; in this view, passengers can truly personalize their itinerary by discovering and choosing different experiences, times, add-ons, and upgrades. Based on customer preferences, airlines can determine which experiences to offer more of on future flights, and which experiences should be replaced—information that Transpose makes uniquely possible. Visual Brand: We kept the entire experience playful and visually energetic to encourage travelers to explore their options and keep them engaged throughout the booking process. Simplified choices: To facilitate decision-making and keep passengers focused, we simplified choices to an essential few. Experiences are grouped into Collections based on themes. A “Recommended Journey” of curated Experiences is intelligently generated for the passenger, which suggests the best combination of Experiences at the best available times. Playful interactions with time: Instead of defaulting to a table or schedule, we designed the the itinerary as an interactive and flexible guide. Playful and intuitive animations were incorporated to engage the passenger throughout the process, especially to inspire and celebrate at key decision points. Scalability: The playful, multi-colored isometric iconography easily scales into a visual system that can be used by multiple airlines. We were inspired by the isometric views of the Transpose interior designs in our choice of iconography. Airbus A³ Transpose is an audacious and revolutionary concept that dares to challenge the future of air travel. It is time to disrupt the commercial aviation industry and surpass passenger expectations of what it means to fly on a plane.